Between the rain and cold most flowers are dormant in this season. Purple violets bloom through the winter here. since these often sleep through the summer heat. Snowdrops are the first bulb to bloom in the calendar year. This lone specimen is my only sample. It will soon be hidden by the daffodils whose leaves are just emerging behind. Pink hellebore buds will open soon. Evergreen leaves can be susceptible to snails, I have heard. My problem pests are voles who have eaten leaves and left me stems. A vole is similar to a mouse, but with a shorter tail. I catch them in mousetraps in the garage and shops. Categories: Uncategorized | Tags: bud, bulb, evergreen, hellebore, mouse, mousetraps, pests, purple, rain, snail, snowdrop, violets, voles, winter | Permalink. Heather flowers are so teeny, they are difficult to photograph. When we first moved here, some of the first plant groupings in the ground was two sets of 2 white-flowered and 2 pink-flowerd heathers around a few daffodil bulbs. Today, those daffodils are totally engulfed by the surviving heathers. Those particular daffodils have not multiplied, but have endured. When I see the white-flowered specimen in full bloom, it makes me think it is sprinkled with snow. Categories: Uncategorized | Tags: evergreen, heather, pink, white | Permalink. This ground cover looks so cool during the month it blooms every summer. Even though the leaves are evergreen, it is pretty non-descript the rest of the year, gracefully fading into the background. I have found this to be deer and rabbit proof, though nothing green is totally safe from hungry predators in a drought season. Again, to keep this plant from spreading where the gardener does not want it to go, one needs to stop watering it. Tough love, garden style. But, there is no escape from a rainy summer. The particular bank where these flowers grow on my land, can get very soggy during the rainy times, and this plant can take it. Recently, while walking with a botanist, I noticed what she pointed out as St. John’s Wort looked nothing like what I grew at home with the same name. She informed me the medicinal herb is quite different than what is sold for a home plant. There is so much for me to learn about my plants, and others I would like to add to my collection. Categories: Uncategorized | Tags: bloom, blossom, cover, evergreen, flower, ground, herb, St. John's, summer, Wort, yellow | Permalink. 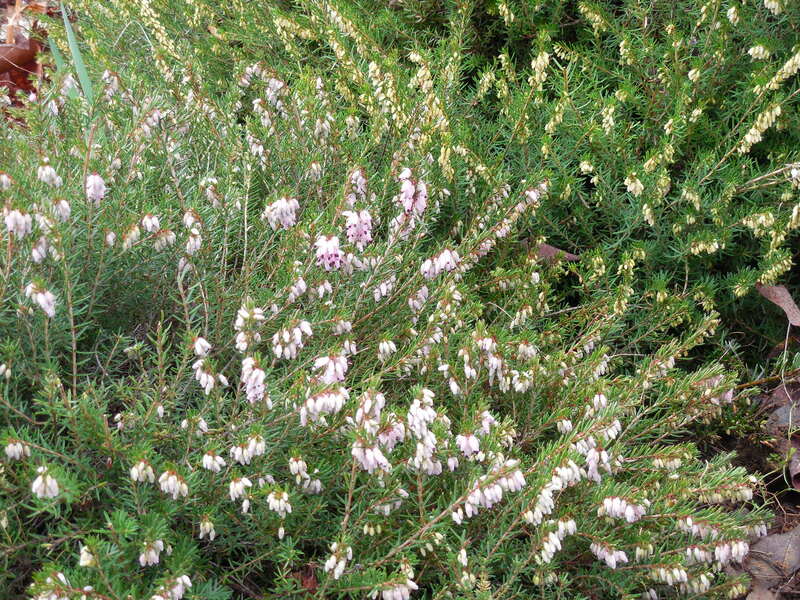 This heather has been in the same place for at least 25 years. The daffodil bulbs were planted at the edges of a few of the heathers, now they come up in the middle of the plants. It also comes in pink, but the pink plants did not grow as prolifically as the white ones did. They are still alive, but much smaller. 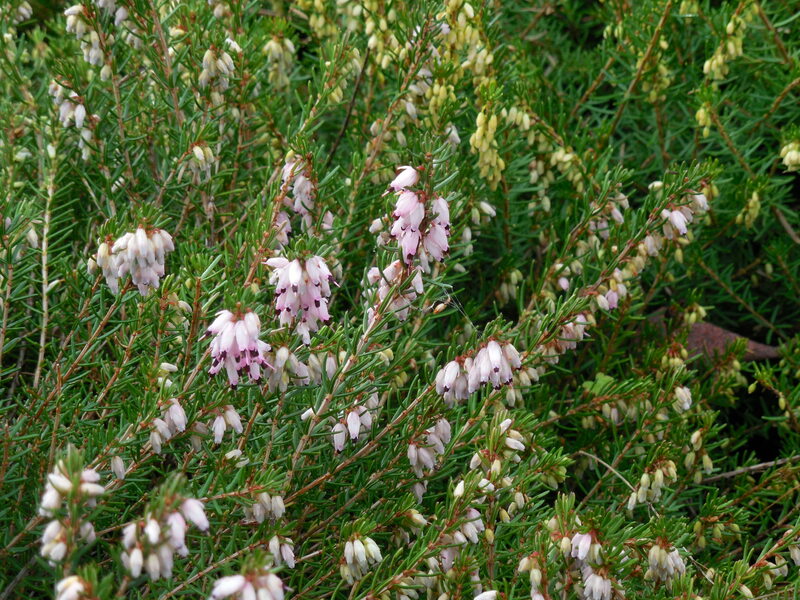 Categories: Uncategorized | Tags: buds, daffodil, deer-resistant, evergreen, flower, heather, white, winter | Permalink. Pink flower buds are peeking from the fern fronds. The distinctive leaves of hellebore confirm that the young plant has survived the winter. I found these flowers in the garden of an elderly neighbor. After she passed, her son let me dig up a plant for my garden. The mother plant is not in a fenced area, and I’ve seen many deer pass through those flower beds. I need to get brave and plant one of these outside my deer-fenced area, to prove to myself they are deer resistant. Once I tried to give a vase of these flowers away, and learned the hard way that they are not ‘cutting’ flowers. They look best on the plant and in the ground. They merely droop like sad-sacks when in a vase. 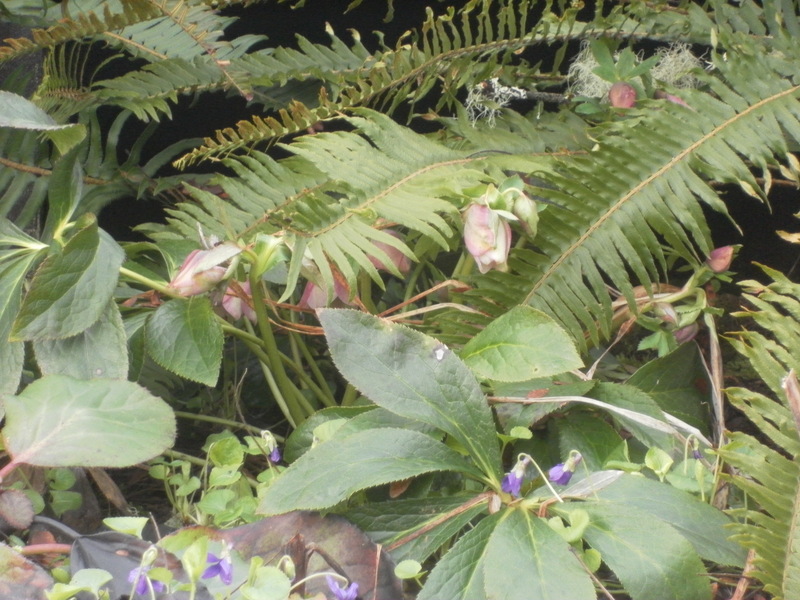 The fern pictured trying to hide the hellebore above is one of a group of ferns that took up residence at the edge of an east-facing deck. I see them in nurseries, but find them to be almost a pest here. They require pruning a couple of times a year, to remove dead fronds and show the flowers I have planted underneath. Well, I just noticed that I already had a post on hellebores. These are some of the same comments by me. I think I’ll leave both posts as a reminder to myself of ?? Have spent some time recently, on non-rainy days, pruning and weeding. So much to do. Dry days in late winter have been the best time to get a jump on busy spring days. Still have plants I bought last fall, to get into the ground, and a number of other plants to move around while the rainy season is still here. Categories: Uncategorized | Tags: deer-resistant, early, evergreen, fern, flower, hellebore, perennial, pink, spring | Permalink.